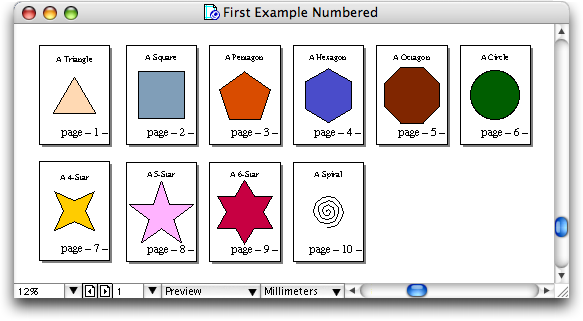 NumberThem is a free Xtra (extension module) that adds automatic page numbering to Macromedia's vector drawing application. First, create a single text box that serves as a template for the placement and formatting of page numbers in your document. 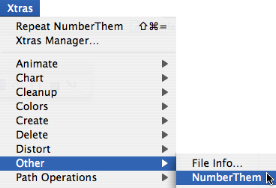 Then invoke the NumberThem Xtra to add page numbers to all pages in your document. After you have added, deleted, or rearranged pages in your document, invoke NumberThem again to update all page numbers automatically. Beyond simple page numbers NumberThem can solve more involved numbering tasks. It offers several different automatic counters and can insert numbers in various formats. There is even support for different placement of page numbers on odd and even pages. Finally, 2-dimensional numbering provides a hierarchical numbering system with two levels, based on the placement of document pages on FreeHand's pasteboard. The NumberThem Xtra has been extensively tested with FreeHand 10, FreeHand MX, and FreeHand MXa running on MacOS X 10.2.x to 10.4.8 with PowerPC- and Intel-Macs. Limited testing has been done with FreeHand MXa running on Windows 98SE and Windows XP. The Xtra has been used on documents of more than 200 pages without problems. The NumberThem Xtra is provided as a disk image for MacOS X and as a ZIP archive for Windows. Both distributions come with full documentation and two example documents. 1.2 27-May-2004 Second public release. Separate Windows version of Xtra available. More intuitive way to set initial values of counters. Fixed: %t and %q work as advertised. 1.1 16-May-2004 First public release. Added independent treatment of odd and even pages. Hide command can be used for single page overrides. Feature complete version for personal testing. The NumberThem Xtra is provided free of charge but remains copyright ©2004 Michael Thies. It may not be sold for profit but may otherwise be distributed freely in unmodified form and complete with its unaltered documentation. It may be included with Shareware or commercial products, if the author has been informed of the intended bundling in advance and it is made clear that the NumberThem Xtra itself comes free of charge and does not form part of the actual product sold. This software is provided as is. No warranty is expressed or implied. The author accepts no responsibility for any loss or damage arising directly or indirectly from its use.